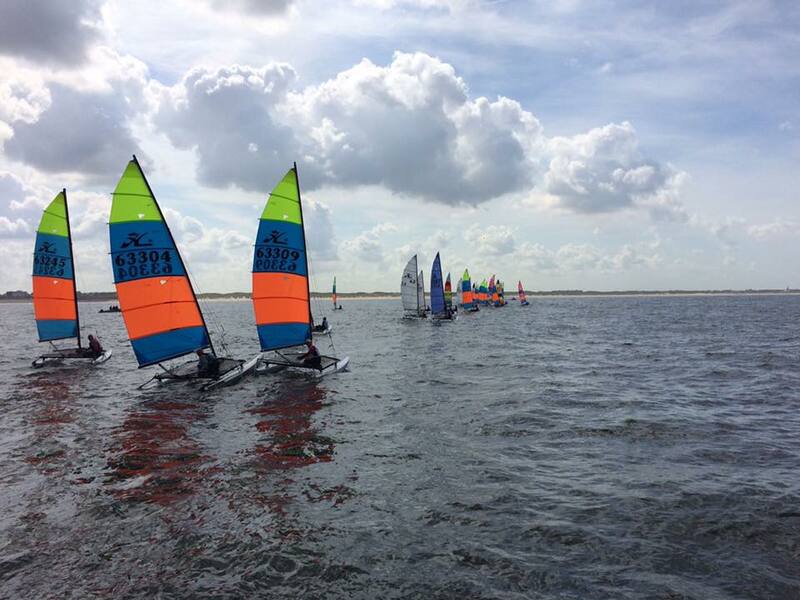 Hobie® 14 and Dragoon World Championships with many European Hobie 16 European Divisions. 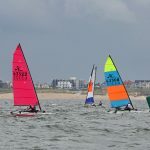 Day 1 of the Hobie 14 and Hobie Dragoon World Championships with the Hobie 16 Spi Youth Europeans at Noordwijk, Netherlands, the sailors were greeted with grey skies and light winds. Though the weather forecast was to change during the day and it did. 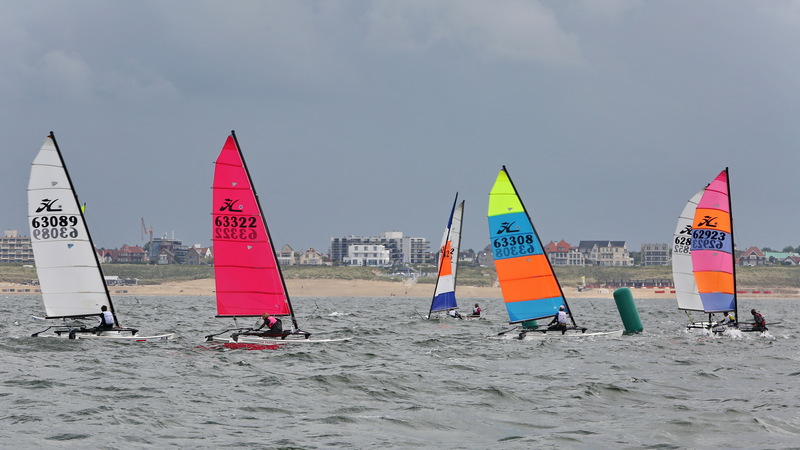 It turned out to be a lovely summers day with three races held for each class. 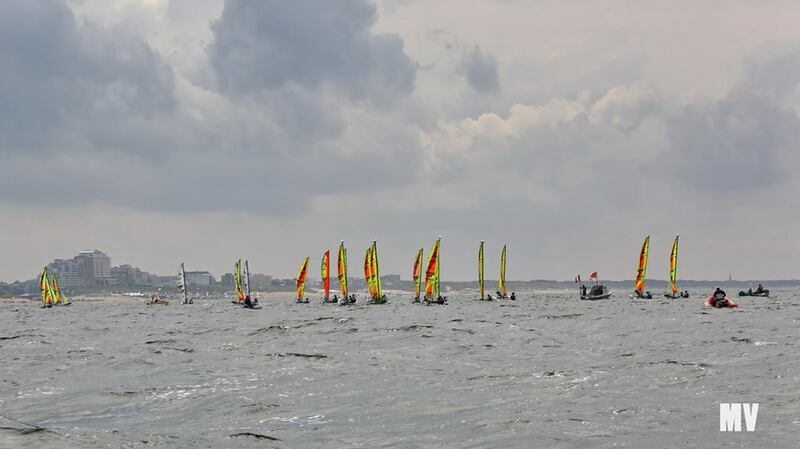 After the races were completed a short shower came with the stronger winds. The weather prediction is for perfect weather tomorrow. On the Hobie 14 course Georgia Warren-Myers started off the championships in fine form. Winning the first two races and second place in the last race of the day. The only person to take a race off Georgia was her husband Fletcher. 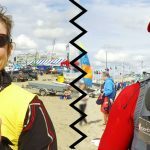 Both said the race course was fair but it has a lot of current on the course. 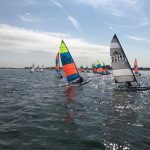 Saying it was a difficult to get maximum boats speed with chop and current. 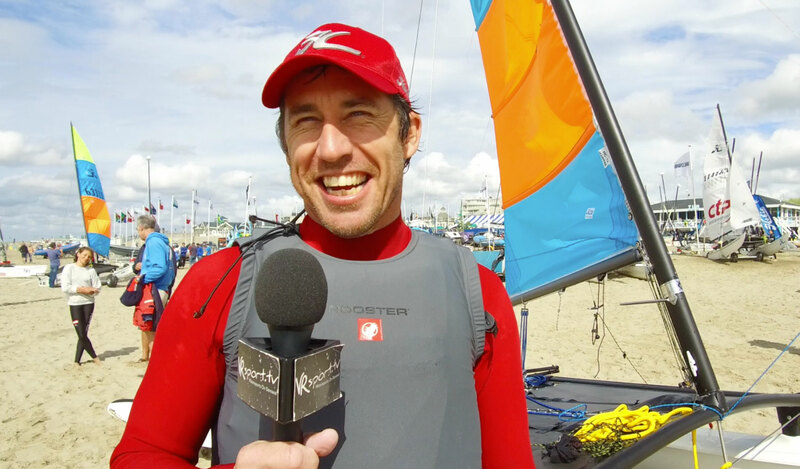 2004 Hobie 14 World Champion Thorin Zeilmaker racing on his home waters also found the current difficult to handle. Hitting the start boat in the second race of the day. 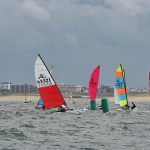 On the other course the Hobie Dragoon World Championships and Hobie 16 Spi Youth Europeans had a difficult time. The current was strong on their course. Two attempts to have the Dragoons race stated was abandoned. 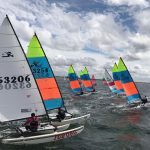 When racing did get underway the breeze had started to build to 8 knots and the young sailors had a great time. The last race of the day the breeze was nearly 14 knots. 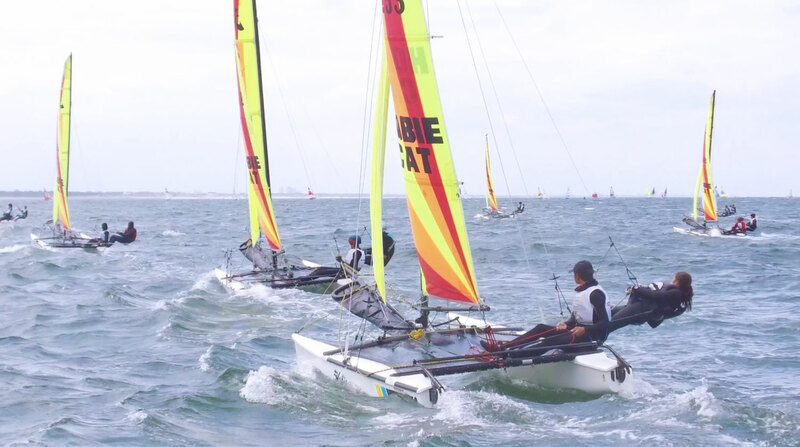 Like the Hobie 14 the young ladies showed the way. 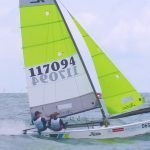 Hobie 16 Spi Youth Europeans, Arthur Boc-Ho/ Brieux Megret stared with a second place and then went on to win the next two races. 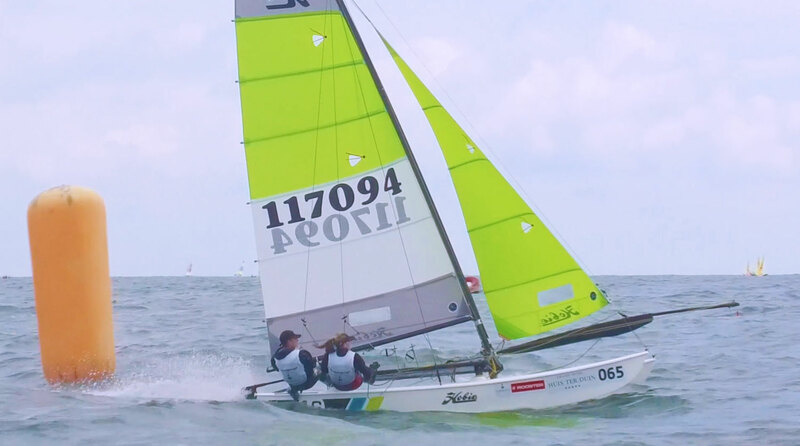 Riccardo Del Prete/ Alice Ciallfi ITA sailed constantly to sit in second place. While Leo Belouard/ Juilett Le Tenier after winning in the first race now sit in third place. 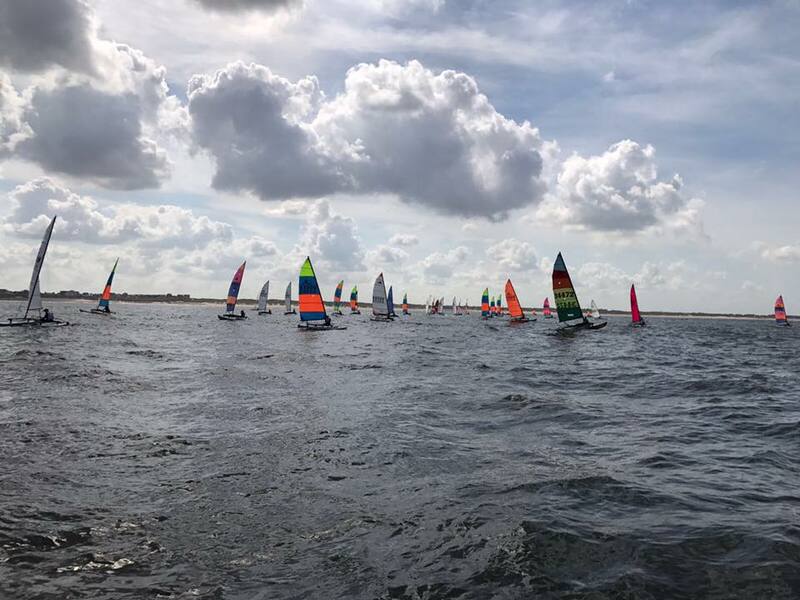 A beautiful sunny second day at the Hobie 14 and Hobie Dragoon World Championships with the Hobie 16 Spi Youth Europeans at Noordwijk, Netherlands. The day started with a gentle side-offshore S/SW breeze. 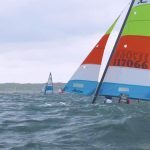 The wind was to drop further during the course of the day, unfortunately. 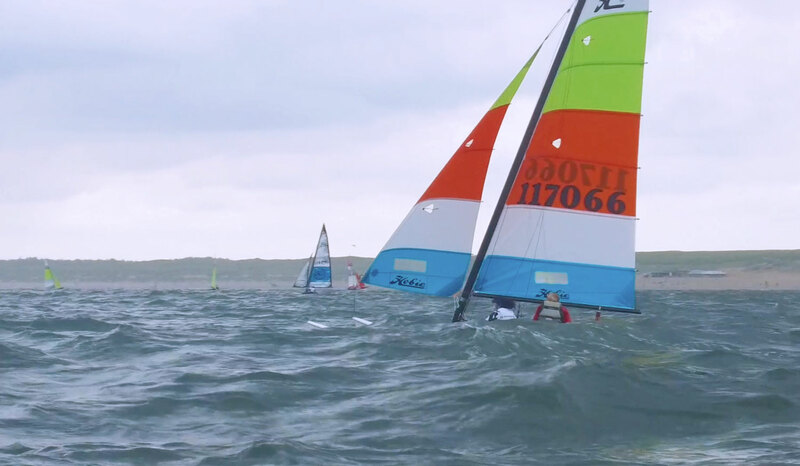 The strong current challenged the sailors. 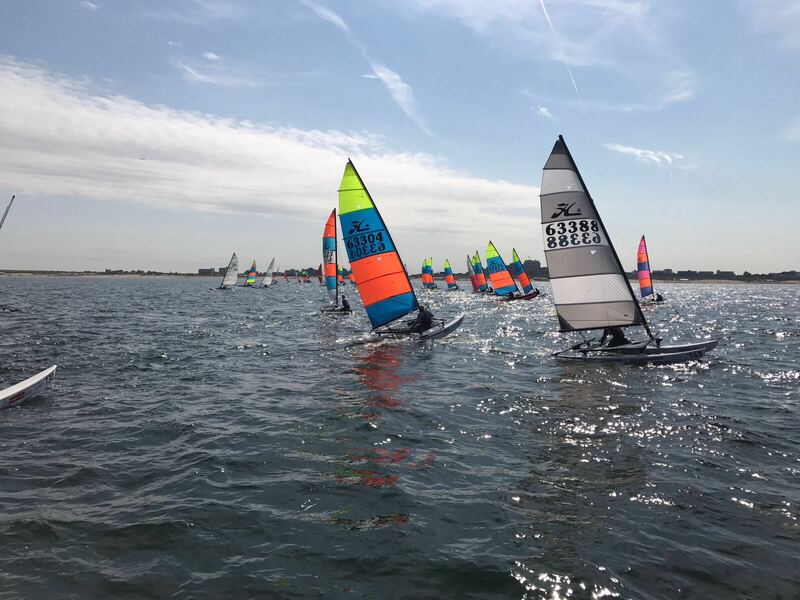 The Hobie 14 class started late, due to several attempts to start with the strong current and shifting breeze. The starting signal for race one was at 12:15. 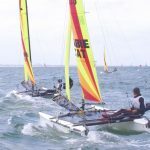 Today one race was sailed. Yesterdays’ winner Georgia Warren-Meyers did not finish within the time limit. With the discard now in place she still maintains the overall lead of the championships. 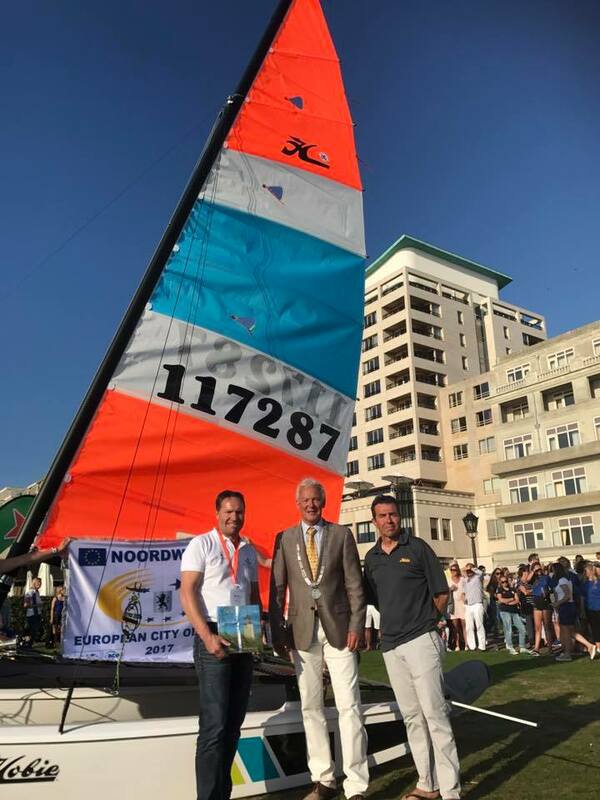 Tonight the Hobie 2017 Multiworlds & Europeans event is officially opened by the Mayor of Noordwijk, at the Grand Hotel Huis ter Duin. 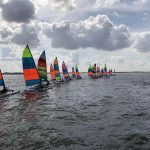 Officials from the International Hobie Class Associations and the chairman of the host to the event, Cees Rodenburg of Zeilvereniging Noordwijk are also on the agenda. Sailors of all 24 participating countries will present their flag in a parade. 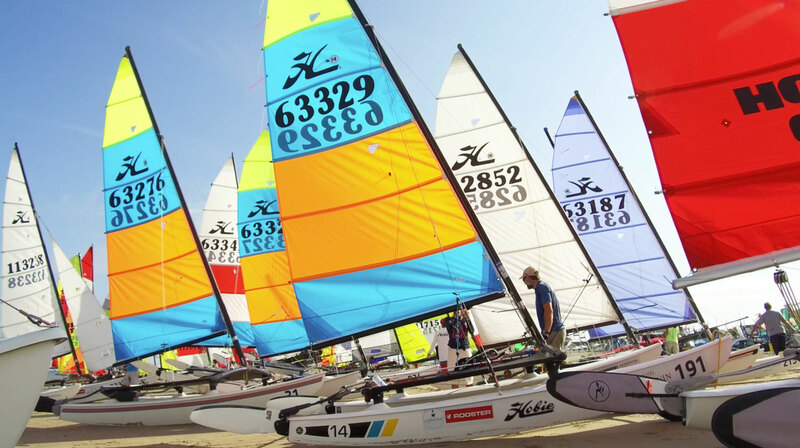 Tonight the public will be introduced to the Hobie 16 class sail, to be used by the 56 sailors in the gold fleet. A very special moment, since this is the first time in history that the sail is disclosed before the actual race day! 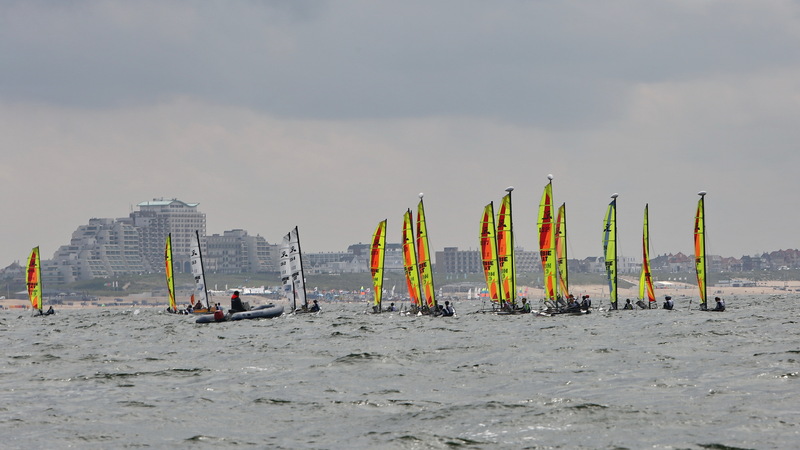 Racing will continue on the two race courses in Noordwijk. 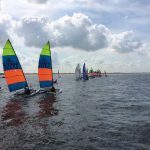 Today was proof that Hobie sailing in the Netherlands is so interesting and fun. 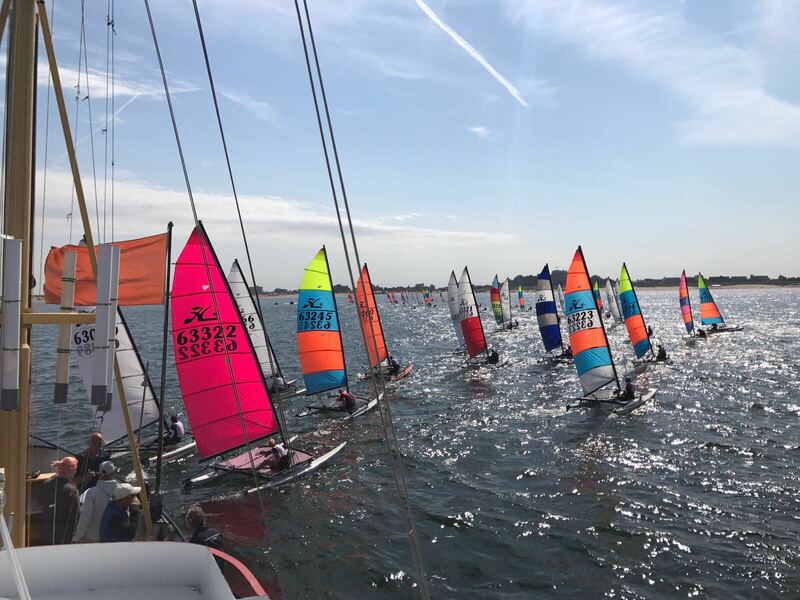 The first two races on Saturday were brilliant, due to nice moderate winds from the West, fortunately nothing like what was forecasted the day before. 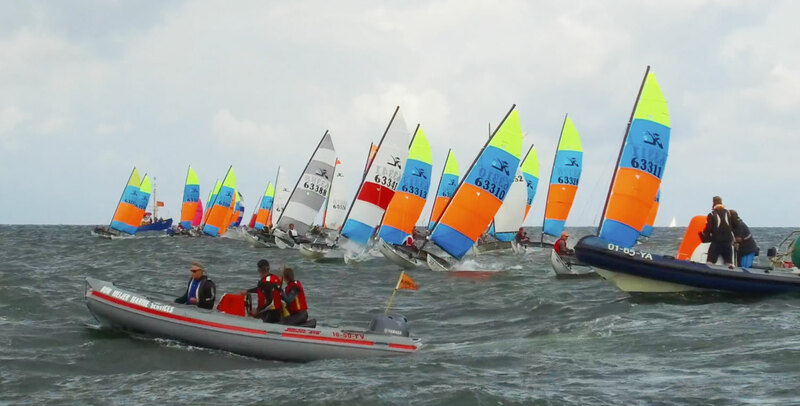 At the starts of race three the wind calmed down a bit, leaving a nice chop on the North Sea. Due to the absolute lack of wind on race day 2, an extra 4th race was sailed today for the Hobie 14, Hobie 16 Youth with SPI and the Hobie Dragoon. 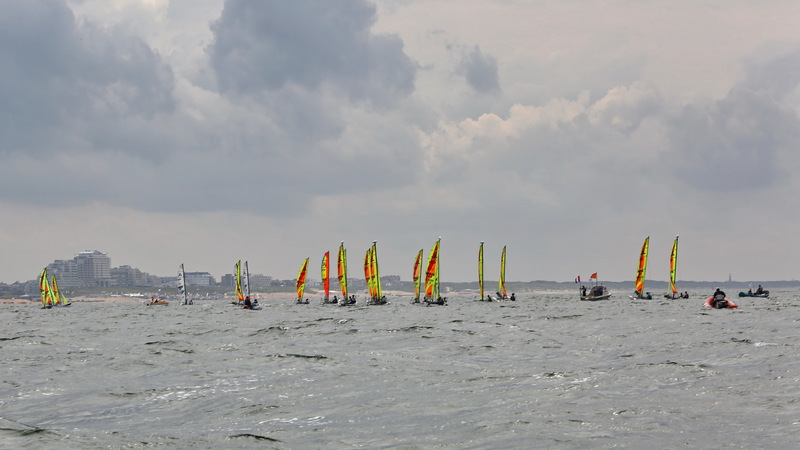 At the start of race 4 the wind picked up again due to overcast, much to the appreciation of the sailors. 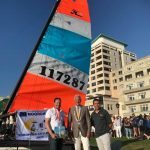 With the increase of wind today reigning Hobie 14 World Champion Blaine Dodds had a good day and moved on to a podium finish. Two first places, a second and 5th. 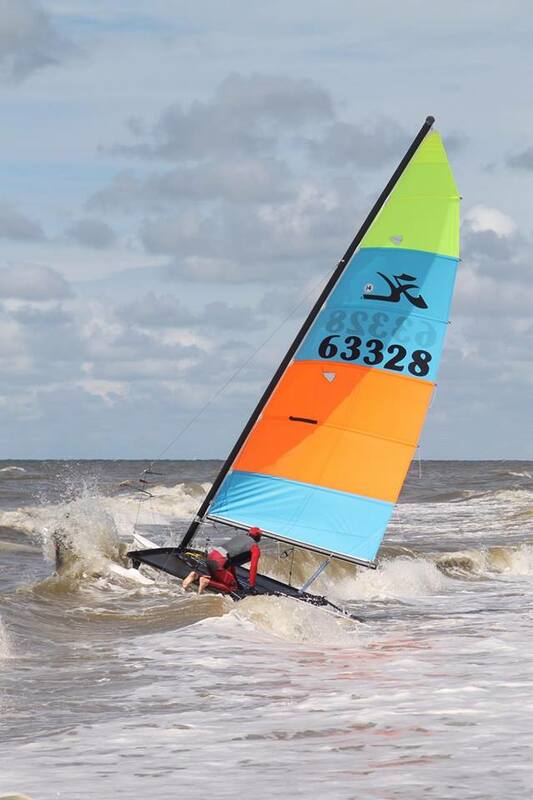 Baine won the race with the strongest wind when it gusted up to 18 knots. 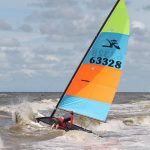 Blaine said ‘when the wind was in I found my speed. 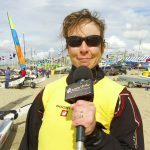 It was wonderful sailing conditions today and I had enjoyed my races today’. 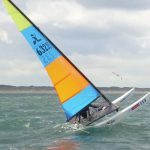 Leader Georgia Fletcher-Myers was in considerable pain today and visited the doctors before sailing. But battled on to keep her championship chances alive. With tomorrow being the last day of racing. 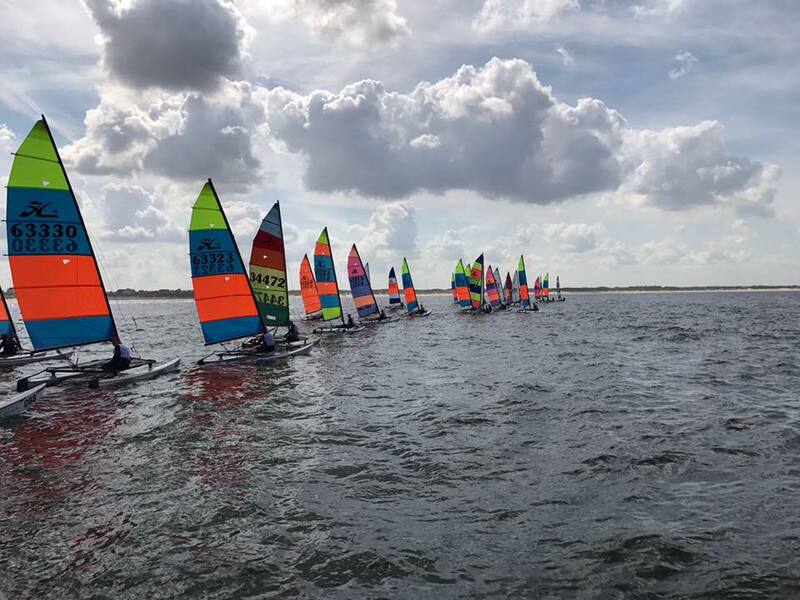 This evening, the sailors, their families and the members of the Zeilvereniging Noordwijk will join in a huge celebration for the 60th anniversary of our host to the Hobie 2017 Mulitworlds & Europeans event. An evening filled with food, drinks, joy and live music! 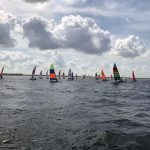 Things are looking good for tomorrow; weather conditions are favourable for interesting racing; moderate side – onshore winds, again from Western directions. And hopefully some sunshine to variate with occasional showers. 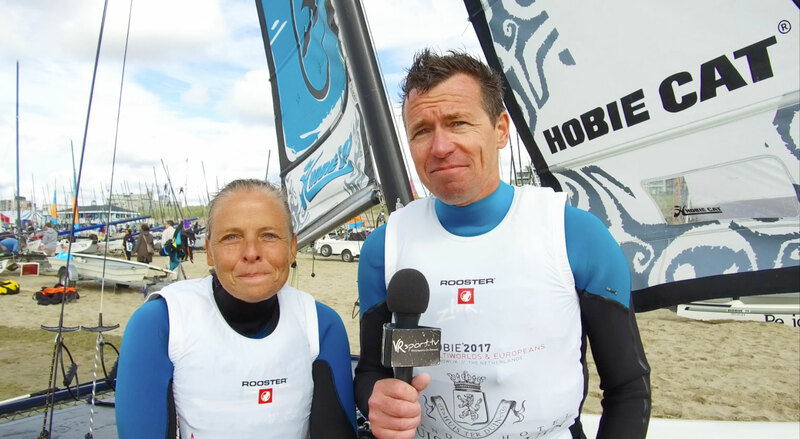 Hobie® Multiworlds & Europeans Day 4 and 2 new Hobie World Champions announced. 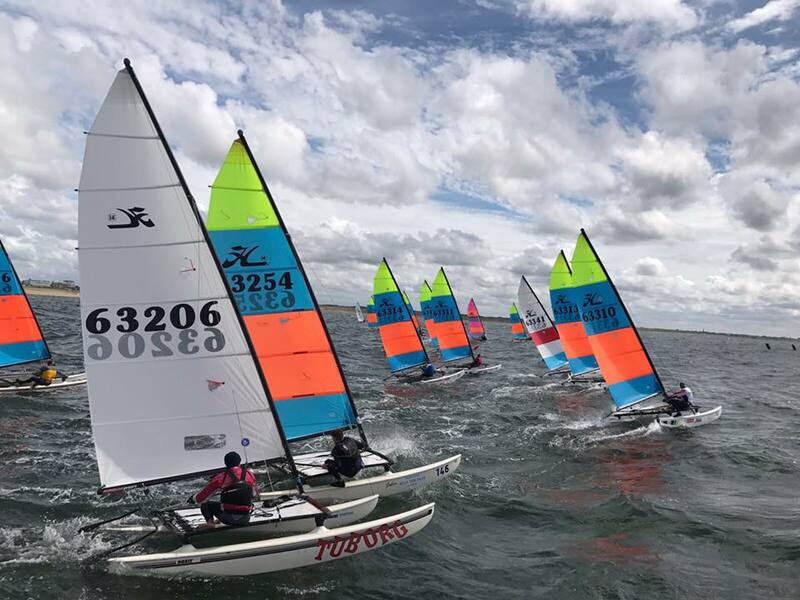 Today, the last race day for Hobie classes 14 and ragoon World Championsips, and European 16 Youth Spi, , EHCA Spi Cup, Masters, Grand Masters and Great Grand Masters was sailed in exciting and later turbulent conditions. The day started with moderate winds from the West / South West and a fair share of sunshine. During the course of the day, the wind picked up to fresh and even strong breezes, causing a massive windswell at sea and a challenging shore-break with the upcoming tide. 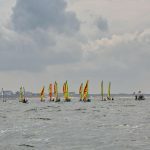 For the saftey of the sailors racing was abandoned due to a threatening thunderstorm. 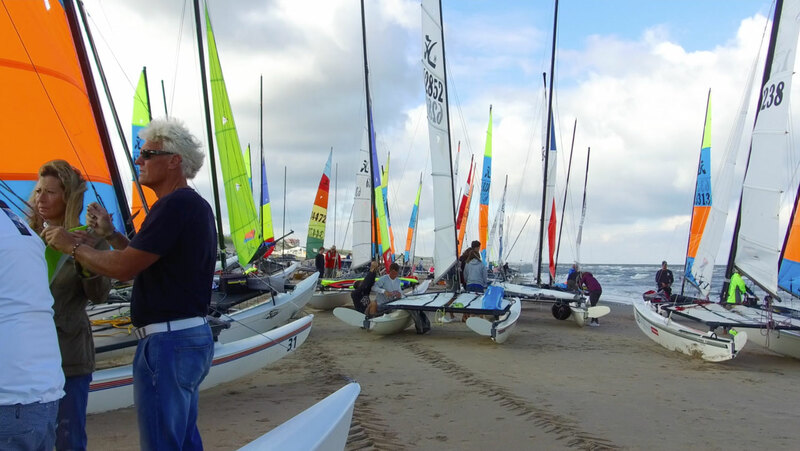 All boats rushed ashore with heavy rainfall and wind speeds reaching up to 27 knots. 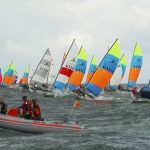 Fortunately, the thunderstorm passed quickly and all sailors came in safe and sound. 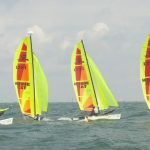 During the rain, the crowds on the beach found shelter in the blue-and-white tent, the Holland Hobie House on the beach, overlooking the Alpha and Bravo courses. 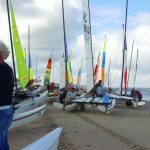 Like the previous days the beach was filled with a great atmosphere; the scent of fresh coffee, mellow music and occasional live footage from the drone hovering the race courses. 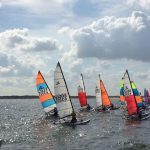 We love the Hobie way of life! 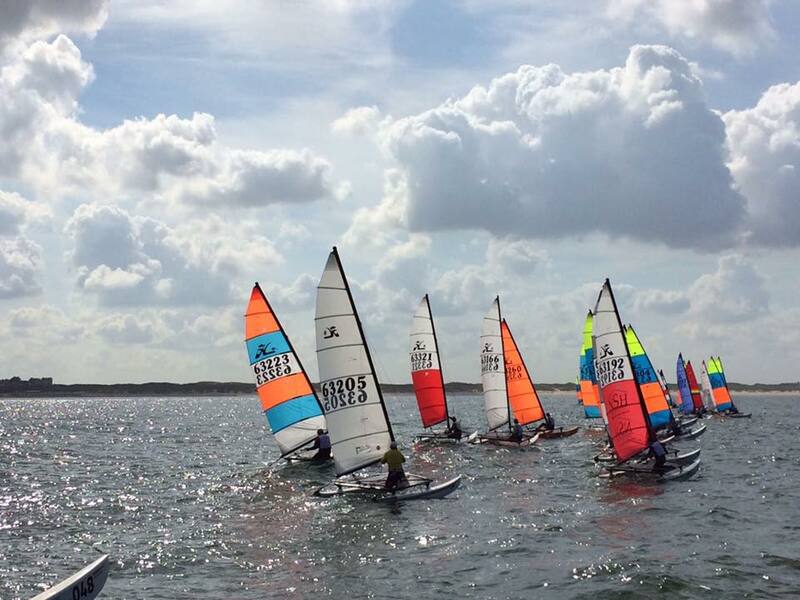 Some time after the general recall, the Hobie 14 and Hobie 16 classes went back to sea to complete their final races. Many sailors chose to stay ashore, due to the strong winds and challenging surf. 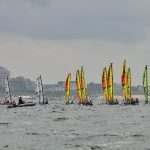 The sailors that went to sea treated the crowds on the beach to spectacular views while challenging the shore break and strong side-onshore winds. 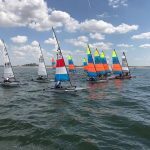 Hobie Dragoon and Hobie 16 Youth Spi did not go out to sail more races and started packing up. 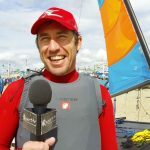 Fletcher paid tribute to his wife and mentioned ‘Georgia won more races than I did’ Though consistency paid off for for Fletcher never sailing out of the top 10. 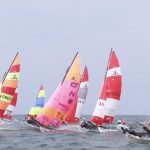 While Defending World Champion showed his trues class in racing when the breeze increased. 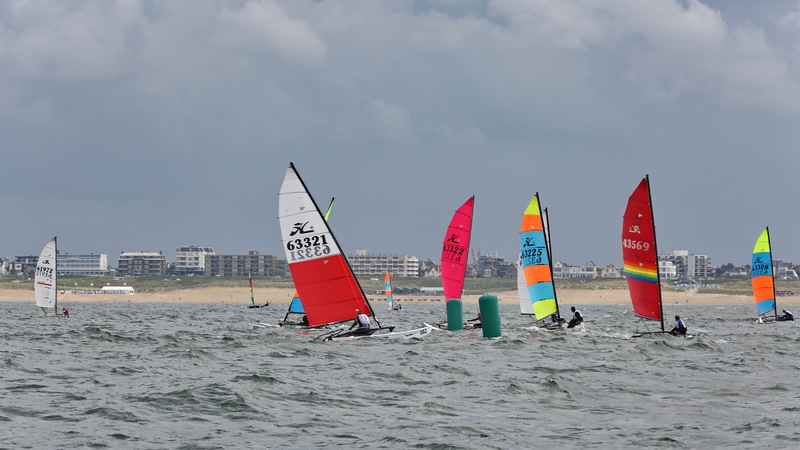 The Hobie Dragoon teams sailed three races today with new World Champions announced. 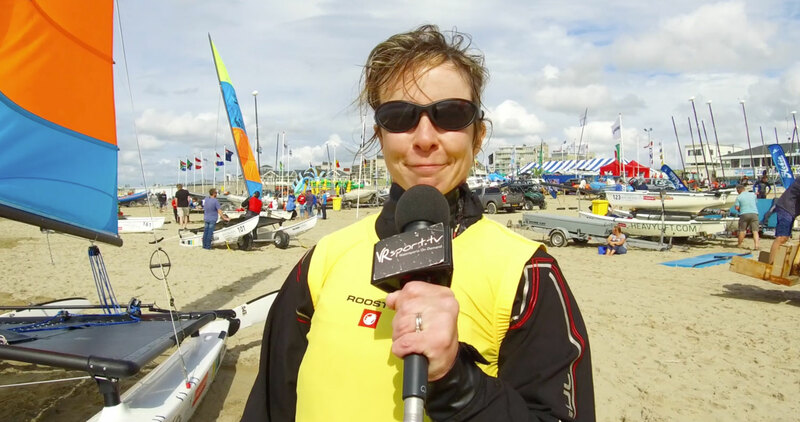 It is the send Hobie Dragoon World Champion in a row that a all female team have won the worlds. 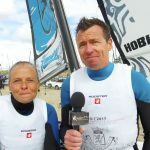 Awaiting the awards ceremony for the Hobie classes that sailed the previous days, sailors and other Hobie fans came together in a celebration party with friendly people, stories about strong winds, big waves, music, food and drink. To all the readers and followers out there: sorry you missed it! Tomorrow, day five of the event, again will be a very interesting. 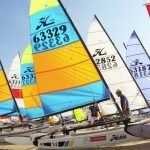 Sailors will compete to qualify for the Hobie 16 Open Championships, with potentially over a hundred boats on the water. 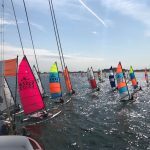 Weather conditions look fair for tomorrow’s races; the day will start with light winds from the North and some sunshine. In the late afternoon, the wind will pick up. 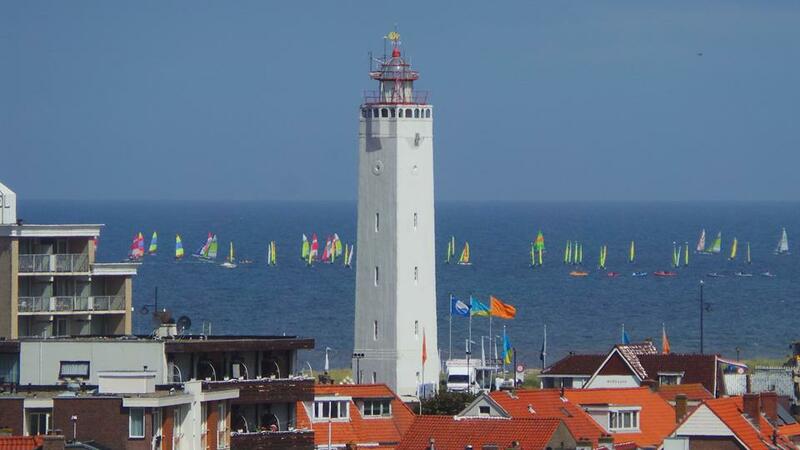 There is lots of rain on the menu for tomorrow, so if you plan to visit Noordwijk to share in the Hobie way of life, make sure to bring your umbrella!